Updated Wednesday, Aug. 27 at 10:07 a.m. The biggest news out of Tuesday’s primary election may have been just how few Vermonters even bothered to cast a ballot. How low was voter turnout? “All I can tell you is it was low,” Secretary of State Jim Condos said Wednesday morning. By then, more than 87 percent of polling places had reported preliminary figures to Condos’ office — and the race for governor had drawn just 33,261 votes. More than 439,000 people are registered to voter in Vermont. Pomfret businessman Scott Milne, the preferred candidate of the GOP establishment, handily defeated three others for the Republican gubernatorial nomination. In 10 weeks’ time, he’ll face Gov. Peter Shumlin — a well-financed, two-term Democrat who easily dispatched his own primary opponent. “I believe I have the opportunity to offer a voice to hundreds of thousands of Vermonters who, like me, want more balance and want a change in the governor’s office,” Milne said Tuesday night. In the race for lieutenant governor, Progressive Dean Corren appeared poised to win a write-in bid for the Democratic nomination, bolstering his chances against Lt. Gov. Phil Scott, a two-term Republican. The closest statewide contest appeared to be the Republican primary for Vermont’s sole seat in the U.S. House of Representatives. Three little-known candidates appeared to have evenly split the GOP vote. By Wednesday morning, Marka Donka, a Hartford police officer and the party’s 2012 nominee, was leading the pack with 3,831 votes, or 33 percent. Donald Russell of Shelburne was following close behind, with 3,737 votes, or 32.2 percent. And Donald Nolte of Derby trailed behind that, with 3,422 votes, or 29.5 percent. Whoever prevails will go on to challenge four-term Congressman Peter Welch (D-Vt.), who did not face a primary challenge. Despite the lack of drama in statewide contests, several county-level law enforcement races proved quite competitive. Defense attorney Doug Disabito defeated Grand Isle State’s Attorney David Miller by a vote of 564 to 446. In Orleans County, State’s Attorney Alan Franklin appeared to be on the verge of losing to his former law clerk, Jennifer Barrett. And elsewhere in the Northeast Kingdom, Essex County State’s Attorney Vince Illuzzi was narrowly ahead of defense attorney Julianne Woolard. In Windham County, former teacher Becca Balint and incumbent Sen. Jeanette White appeared to have won the sole contested primary for the Vermont Senate. They were up against former secretary of agriculture Roger Allbee and health care navigator Joan Bowman in the Democratic primary. With just three towns left to report Wednesday morning, White was ahead with 40.3 percent of the vote. Balint had 28.9 percent, Allbee 22.2 percent and Bowman 8.4 percent. The vote all but guaranteed White and Balint the county’s two seats in the Senate. In Chittenden County, appointed Sen. Michael Sirotkin and newcomer Dawn Ellis joined incumbent Sens. Tim Ashe, Phil Baruth, Ginny Lyons and David Zuckerman in winning slots on the Democratic ballot. They’ll face Sen. Diane Snelling and attorney Joy Limoge, both Republicans, as well as six Libertarians, this fall. Veteran Chittenden County Sheriff Kevin McLaughlin appeared to have fended off a challenge from Ed Cafferty, a Democratic activist and adjunct professor of criminal science at Champlain College. With 30 of 32 polling places reporting Wednesday morning, McLaughlin was ahead 2,808 to 1,300. In Winooski, first-time candidate Diana Gonzalez and incumbent Rep. Clem Bissonette bested former state representative Ken Atkins in the Democratic primary for the two-member House district. Gonzalez, who also won the Progressive nod, and Bissonette will face former Progressive Party executive director Robert Millar in the general election. In Burlington’s New North End, Kevin Garrison defeated former school board commissioner Linda Deliduka and Ed McMahon to fill a seat vacated this summer by Greg Jenkins. 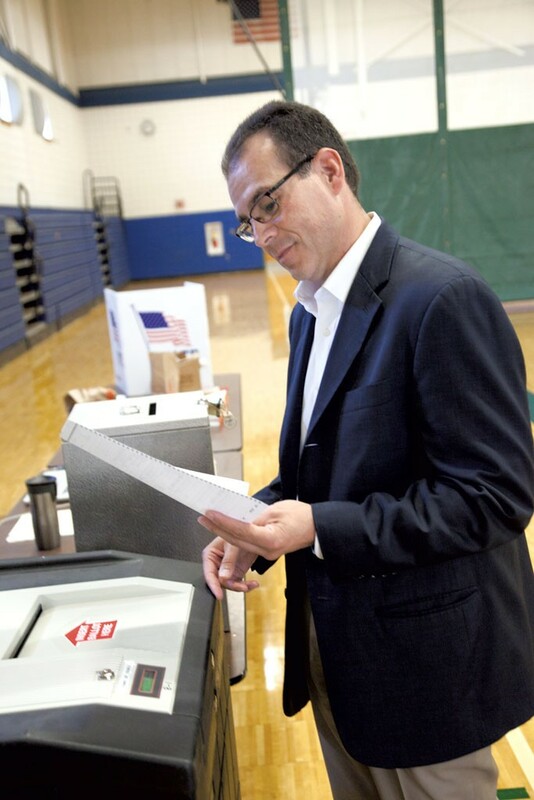 Libertarian gubernatorial candidate Dan Feliciano casts his ballot in Essex on Tuesday. Frustrated with Milne’s wait-and-see approach to Shumlin’s proposed health care overhaul, several conservative GOP leaders last week endorsed Libertarian Dan Feliciano’s write-in candidacy for the Republican nomination. Nevertheless, Milne walked away with nearly 73 percent of the vote, according to preliminary results, while write-in candidates won just 14 percent. How many of those went to Feliciano won’t be clear for days, Condos said, as the secretary of state’s office waits for final tallies from city and town clerks. With more than 87 percent of polling places reporting, Steve Berry of Wolcott and Emily Peyton of Putney had each won less than 7 percent of the vote. Despite Milne’s success, Feliciano and Peyton will both appear on November’s ballot. Feliciano was uncontested for the Libertarian Party’s nomination, while Peyton also filed as an independent. They’ll face Shumlin, Liberty-Union candidate Peter Diamondstone of Brattleboro, Irasburg independent Bernard Peters and Chester independent Cris Erikson. Milne hailed his victory over what he called a “small contingent in my own party” more focused on “an ideological battle” than on winning. “I’m hopeful that the relatively weak showing of my opponents means most Vermonters want to unite around the things we agree on,” he said. “I thought we would do better, but I’ll still continue to campaign on the message that I’m holding firmly to: stopping single-payer, reducing spending, school choice, property-tax reform and the Second Amendment,” he said. For his part, Shumlin defeated former Republican H. Brooke Paige in the Democratic primary, 78 to 17 percent, according to preliminary results. In the weeks leading up to Tuesday’s election, supporters of Shumlin’s 2010 primary opponent, Doug Racine, who the governor fired as Agency of Human Services secretary, pledged to write Racine in for governor. At least 1,105 people, or 6 percent of those voting in the Democratic primary, chose a write-in candidate, though it’s unclear how many of their votes went to Racine. In the race for lieutenant governor, one thing is for certain: Two-term Republican incumbent Phil Scott will face a tough challenge from former Progressive legislator Dean Corren. It will be that much tougher if it turns out Corren succeeded Tuesday in winning the Democratic nomination as well. 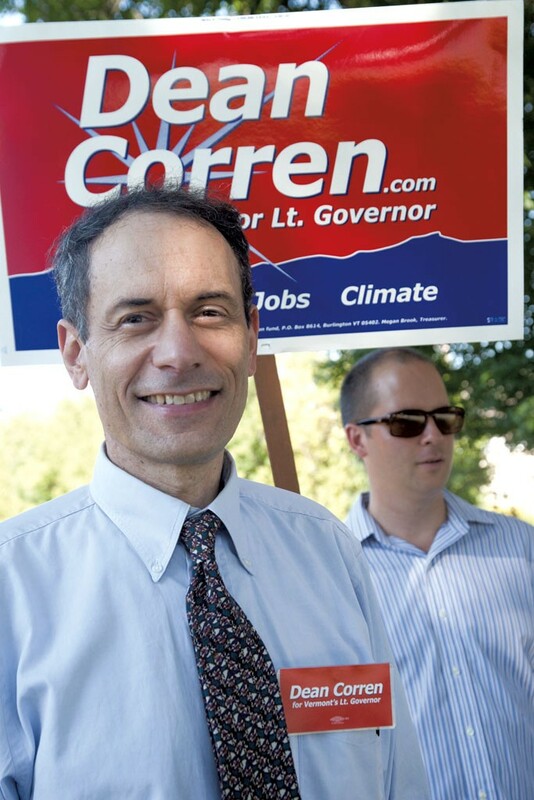 Progressive Dean Corren campaigns for lieutenant governor Tuesday. Because the only declared Democratic candidate, John Bauer of Jeffersonville, dropped out just before the filing deadline, Corren needed just 250 write-in votes to win the party’s nod. With more than 87 percent of polling places reporting Wednesday morning, 5,126 Democratic voters had selected a write-in candidate. It’s unclear how many of those votes went to Corren — and how many, for that matter, went to Scott — but both men seemed confident that Corren won the day. Scott, a Berlin contractor, conceded that Corren would likely emerge with both the P and the D label. Joining Scott and Corren on the general election ballot will be Marina Brown, a Liberty-Union candidate from Charleston. Paige, who challenged Shumlin for governor, also challenged eight-and-a-half-term incumbent Bill Sorrell for attorney general. But like Shumlin, Sorrell defeated Paige by a wide margin: nearly 80 percent to 19 percent, according to preliminary results. Other AG candidates could yet emerge. Underhill attorney Shane McCormack waged a last-minute write-in bid for the GOP nomination, and Republicans cast at least 1,833 write-in ballots on Tuesday. Liberty-Union candidate Rosemarie Jackowski of Bennington will also run in the general election. None of Vermont’s other statewide officeholders — Democratic Treasurer Beth Pearce, Democratic Secretary of State Jim Condos and Democratic/Progressive Auditor Doug Hoffer — faced opposition in Tuesday’s primary. In the general election, Liberty-Union candidate Murray Ngoima of Pomfret will oppose Pearce for treasurer. Progressive Ben Eastwood of Montpelier and Liberty-Union candidate Mary Alice Herbert of Putney will oppose Condos for secretary of state. It appears to have been a tough day for incumbent prosecutors. Miller, the Grand Isle state’s attorney, was unseated by Disabito in the Democratic primary. The final vote was 564 to 446. Disabito, a defense attorney, spent several years working as a court officer in Grand Isle. He will not face an opponent in November. Miller was first elected to the job in 2003. Franklin, the Orleans County state’s attorney, appeared to be on the verge of losing to his former law clerk in the Republican primary. With 17 of 20 precincts reporting, Barrett, who is currently a deputy prosecutor in Bennington County, had 927 votes to Franklin’s 708. While sitting state’s attorneys rarely face challenges, Franklin was opposed by both Barrett, who he hired out of law school, and his current deputy, James Lillicrap, who was unopposed for the Democratic nomination. During the campaign, Barrett criticized Franklin’s work habits — and what she characterized as a lenient approach to prosecuting defendants. She scored an endorsement from the Newport police chief. Franklin was appointed state’s attorney by Gov. Peter Shumlin in 2011. His fellow Northeast Kingdom prosecutor, Illuzzi, was also facing a strong challenge in Essex County’s Republican primary. With 8 of 13 precincts reporting, Illuzzi was besting juvenile defense attorney Julianne Woolard, 152-106. Illuzzi, a former state senator, was first elected state’s attorney in 1998. Gonzalez, the Progressive/Democrat, won 267 votes in the race to represent Winooski in the Vermont House. She’ll advance to the general election, alongside incumbent Bissonette, who won 227 votes. Atkins, a former state representative who was looking to return to the Statehouse after a two-year absence, received 198 votes and was eliminated, according to City Manager Katherine Decarreau. Gonzalez and Bissonette will square off against Progressive Millar for the district’s two seats in November. The district includes Winooski’s 7,300 residents and a sliver of Burlington. "I'm really excited. It shows folks are interested in a new perspective," Gonzalez said. "I'm glad the door-knocking paid off. People are excited about a fresh voice." Millar had launched a late bid to win write-in votes in Tuesday’s Democrat primary. Decarreau said there were 110 write-in votes that had not yet been tabulated. Gonzalez and Millar are both young transplants who moved to the city in recent years, while Bissonnette and Atkins are both Winooski natives who have served in all manner of official capacities and boast deep webs of longtime connections. Still, the city has seen a deluge of young professionals and refugees in recent years, spawning a resurgent downtown. Gonzalez, 36, is a doctoral student at the University of Vermont. She is making her first bid for public office. 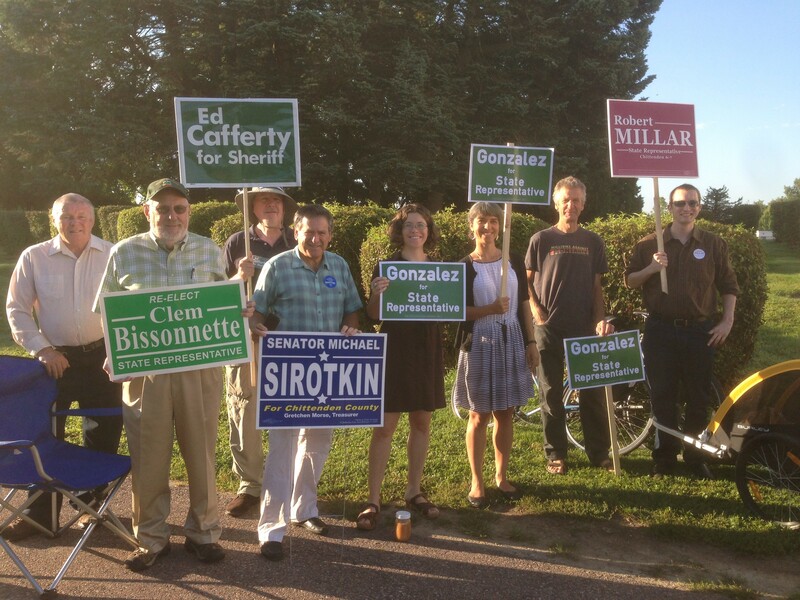 Bissonnette, first elected to the House in 2008, has served as mayor and School Board chairman in Winooski. In the Ward 7 school board race, Garrison won 351 votes; Deliduka received 259 and McMahon, 63. The 14-member board had been short one person over the summer after Greg Jenkins resigned. Garrison's campaign, which received support from both liberal and conservative quarters, withstood a fracas — much of which took place on Front Porch Forum — over the support he received from conservative donor Lenore Broughton and his campaign manager, board member Scot Shumski.